You are invited to participate in the Twenty-Fourth Annual Conference on Neural Information Processing Systems, which is the premier scientific meeting on Neural Computation. A special symposium was held in memory of Sam Roweis. Peter Bühlmann, ETH Zurich; Dana Ballard, UT Austin; Stephen Wright, UW Madison; Nathaniel Daw, New York U; Stefano Soatto, UCLA; Peter Hoff, U of Washington. 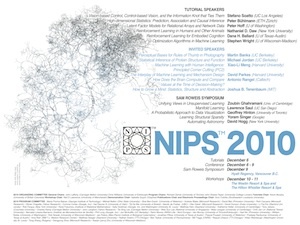 The Twenty-fourth Annual Conference on Neural Information Processing Systems (NIPS) is a single-track machine learning and computational neuroscience conference that includes invited talks, demonstrations and oral and poster presentations of refereed papers.